I was in the Bay Terrace Shopping Mall this afternoon, so I stepped into FYE, which to my knowledge is the only music store still left in Queens. I browsed around and looked at prices. I was interested in the new CD Electric Dirt by Levon Helm (formerly of the Band). Their price was $19.99 while the price at Amazon.com was $7.99. Of course, I waited until I got home and ordered it online. I don't mind waiting a few days for it to come in the mail. Since I ordered 3 CDs for about $27, I got free shipping. If I need a new CD in a hurry I can always download it through Itunes or Amazon.com. I have done that a few times, but not recently. 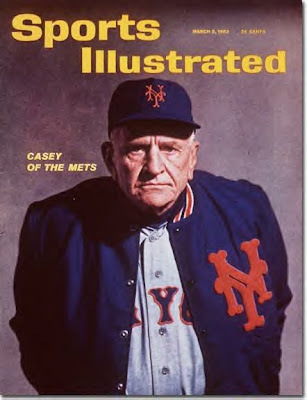 Casey was born July 30, 1890. He managed both the Mets and Yankees and had his uniform #37 retired by both teams. Also, Happy Anniversary to my sister Joyce and husband Keith. They were married 26 years ago today. I remembered to send a card. If I had to dream about information literacy, then I eally had too much to dream last night. Is there any way I can stop work related thoughts while I am sleeping? Did you have the experience when a song came on the radio, you just dropped everything to listen to it? That happened to me at work of all places. I usually listen to the radio through the internet when I arrive and do mundane chores such as checking e-mail. At about 8:40 AM Don McGee the DJ on WFUV announced that a Bob Dylan song would be played after the news break. Since WFUV has such a wide playlist, I couldn't even venture a guess as to what Dylan song would be played. He played Dark Eyes as it appeared on the Empire Burlesque album released in 1986 which I have in vinyl. Please check out the lyrics. I saw Bob and Patti Smith sing this as a duet in December 1995 at the Beacon Theater. The Youtube video below was taken in Philadelphia during the same tour. I went to the oral surgeon this morning to have an implant placed where I had a tooth extracted a few months ago. I am far from finished. The last step which will not take place for 6 months is the placement of a crown to replace the tooth. Yes, this is a very boring entry. Who wants to read about someone elses dental problems? I remember years ago my mother had gum problems and had to go a periodontist. She would bore my father and me by talking about her dental procedures. Broadway shows are very expensive. Last year we paid $100/ticket to see Jersey Boys for Lee's birthday. I also like a little variety in my "entertainment diet". I can't watch baseball games or listen to my radios all the time so I am always looking to try different forms of entertainment at different venues at a reasonable price. I found out about "I'm the Greatest Star" a Broadway musical review playing at Hofstra University. A few years ago we saw a remake of "Grease" there. HD radio has not been greatly accepted to date. There are some technical problems relating to the signal. It is very hard to get reception of the HD signal unless you live relatively close to the transmitter. A radio enthusiast would be likely to purchase a special FM antenna, while a casual listener would not. Another problem is that the programming on HD2 stations are essentially just music streams. The selling point is that a subscription for these stations are not required as they are for Sirius/XM. I reported that the country station in NYC has been moved to 106.7 HD2. This stations does have a voice tracked DJ who comments on the music. Hopefully this enhancement will move to other HD2 stations. I have resisted the temptation to buy the first portable HD radio on the market. 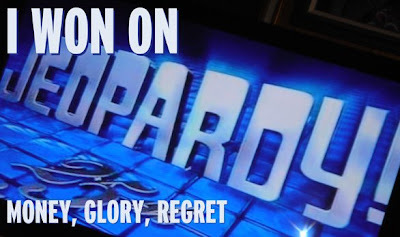 It is hard to believe that it is 25 years since the current version with Alex Trebek first took the air. I was pleasantly surprised to see a Bob Dylan category on tonight's show. Of course, I got all 5 questions correct. Lee made a mistake as he was confused about the Dylan films "Masked and Anonymous" and "I 'm Not There." The final Jeopardy question was about the #1 song in September 1984. It was Tina Turner's What's Love Got to Do With it. 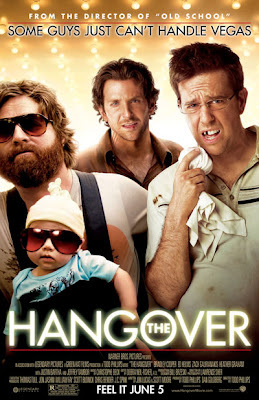 I'll have to find something else to do at 7 PM for the next 6 weeks as reruns will be aired. I drove out to Cunningham Park this morning to get some exercise. I read this week's Sports Illustrated. There were article about the best baserunners in major league baseball, Ron Artest who recently signed with the L.A. Lakers, and Florida Gators quarterback Tim Tebow. I got home at 12 noon in time to listen to the Beatles on Q-104.3. Maria Melito played a set of 3 George Harrison songs. At 12:15 I turned on 106.7-HD2 to hear Classic Lite for the last time. Tomorrow country music is supposed to move to that station. At 12:30, I turned on the Meredith Viera version of Who Wants to Be a Millionaire but at 12:35 it was interrupted a news report about elected officials in New Jersey who were arrested for corruption. This was important, but I didn't enough to break into scheduled programming. If this happened during Jeopardy I really would have been pissed off. I went downstairs to read. About a week ago I purchased from Amazon the book So You Want to be a Rock'N'Roll Star, The Byrds Day by Day 1965-73. I have read biographies of the Byrds and its members, but this volume gives a detailed account of what the group did every day. Sometimes reading all the details can be boring. This was a heavy coffee taqble book which I can not schlep on the trains to work next week so I have to read it at home. I then turned on Mike Francesa on WFAN who complained that ESPN TV and radio did not report the situation about Ben Roethlisberger, since he is a favorite of that organization. I decided to walk down the block to the public library to check out a book that is light enough for me to schlep to work. I found Miracle Ball: My Hunt for the Shot Heard 'Round the World by Birian Biegel and radio personality Pete Fornatale. This is aobut the home run that Bobby Thompson hit off Ralph Branca in the 1951 National League playoff. While I was in the library I heard two people arguing about taking too long on a computer. I hear enough of this at NJIT, do I really want to hear about it on my vacation. Believe me, when I go to the public library, I find my book, check it out and leave. I don't need any more library aggravation. When I came home and started surfing the web I got a phone call from contest enthusiast Cara Sieden. There was a question on B-103 about what hit did Rod Stweart sing with the Temptations. I didn't know the answer immediately, but I was able to look it up in my Joel Witburn book which lists every hit that was ever charted. It was the Motown Song recorded in 1991, I don't know if Cara won the contest. I just found out that country music will move to 106.7 HD2 on Friday. That is now known as Classic Lite. I thought that it was too much like WCBS-FM and was somewhat redundant in its playlist. 1996 was the last time that country music was heard on the regular FM airwaves in New York City. I don't want to give anyone a long radio history lesson here, but In February 1996 country music ended on WYNY at 103.5 FM. At that point in time it became WKTU as a rhythmic/dance station billed as the Beat of New York. Since that time there were a few suburbans stations who played country music, but they changed formats. 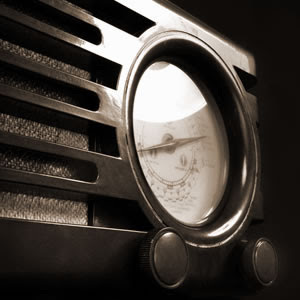 When HD2 radio stations became available in 2006, 103.5 HD2 became a country music station. Today 103.5 HD2 became a rhythmic station appealing to a gay and lesbian audience. It is now known as Pride Radio. I believe that the owner Clear Channel has this format on HD2 stations in othr markets. Right now I am listening to country music on Sirius/XM. People in NYC who like country music will have to get it from internet streams. Back in 1965 when the Beatles appeared at Shea Stadium, I just didn't have the money to buy tickets. Earlier in the day I found in our VHS collection a tape of the Beatles at Shea. Murray the K and Cousin Bruce Morrow were the announcers. The stage was set up in the middle of the stadium as the Beatles sang for only 35 minutes. The screams of the girls in the audience drowned out the singing. It rained for most of the day and I was just hoping that the weather would not put a damper on the concert literally, We arrived at Citifield at 6:40. I am always an early bird :). The stage was set up in deep center field. Obviously many of the seats for baseball could not be used since people there could not see the stage. There were seats on the playing field. Nothing happened until 7:25 when an opening called Smith from Dublin, Ireland took the stage and played for 45 minutes. The people in the audience were of all ages ranging from small children to seniors who listened to the Beatles in the 1960s. Lee wore his t-shirt of the Beatles at Shea. This extra time gave people the opportunity to buy food and beer. This is fine, but I just can't understand why people must leave their seats to buy the overpriced beer as this concert is likely a once in a lifetime event, while one can drink beer anytime. Finally, at 9 PM, Sir Paul and his backup band took the stage. Whenever, I went to Bob Dylan concerts I always had to guess what songs he was playing. Sometimes it would take me a minute or to guess the song if it were one of his rarities. Friday's set list appeared in Sunday's New York Times. So we knew what song was coming up as the set list was the same. I was unfamiliar with just a few songs that Paul recorded as a solo artist. I especially enjoyed Paul's version of George Harrison's Something. He started playing a ukelele and then moved to a guitar. Photos of George were shown on a screen in the background. Paul made a tribute to John by playing Here Today and Give Peace a Chance. Another highlight was the fireworks display during Live or Let Die. Paul certainly has his voice after all these years of performing. Bob Dylan's voice has obviously declined after all these years of giving concerts. Billy Joel did not appear as he did on Friday. I was also hoping for Ringo Starr, but he wasn't there. It is obviously imposible to play everything in the catalog. I would have liked to have heard Penny Lane and Coming Up. There was a warning for people not to take photos and videos, but I saw many people with cameras. If you do a search on Youtube under McCartney and Citifield you will see many amateur videos. At the top of this entry you will see Paul seeing I'm Down which was played both at Shea and Citifield. I'm Down was the B side of Help, but was not heard in the film. I will upload these photos to Facebook, but I suggest my Facebook friends go to this web site since the photos have captions and annotations. It was 40 years ago today that Apollo 11 landed on the moon. 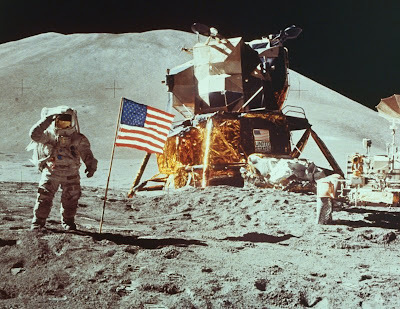 It is a shame that after the Apollo program concluded in 1972 that there were no further moon landings. Perhaps the reasons were budgetary or maybe politics had something to do with it. Hopefully in the years to come there will be a second generation of lunar exploration. I think back to what I was doing on July 20, 1969. I was a student at the City College of New York taking summer classes in basic economics and sociology. They closed school on Monday July 21 to celebrate. Since classes were in the morning I worked at Alexanders Department Store in Rego Park from 2 PM - 6 PM. I was dating a girl named Elissa who lived in Eastern Queens. Everyone's Gone to the Moon by Jonathan King was a hit in 1965. Radio stations did play it as an oldie in the summer of 1969. For the first time in 4 years we took a day trip to Atlantic City. We decided to wait until this year so that we could take Lee to the casinos since he has passed his 21st birthday. The bus came by at 8:30 and we arrived in Atlantic City at about noon. Security is very tight in the casinos. We had to show identification to get a card allowing us to gamble and to get a $25 voucher. While we were in the casino about 4 people walked up to Lee asking for ID since he does not look 21 years old. I did not like the new technologies for the slot machines. It was somewhat fun to insert a quarter and hear the quarter spew out of the machine after a win and place your money in a cup. Now winnings and loses are recorded on a computer card. Of course, I took my Sony Walkman to listen on the bus. I was able to check out several radio stations along the Jersey shore. We got home about 10 PM. 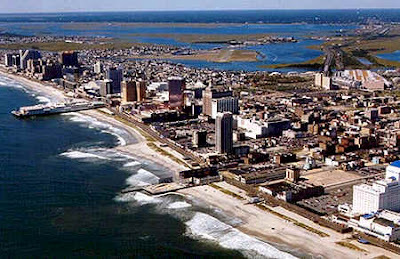 A disadvantage is that 7 out of the 13 hours are spent traveling from Queens to Atlantic City, but with the casino voucher, the trip is almost free. I never had much gambling spirit, so playing with the slot machines is like laying video games. I just lost the $25 from the voucher. We spent some time walking along the Boardwalk and bought some of the famous Atlantic City taffy. 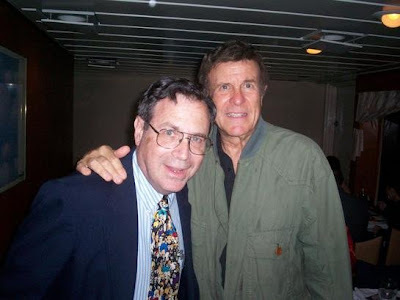 Since Allan Sniffen wrote a memo calling for the demise of Saturday Night Oldies there has been a flurry of activity and speculation among the show’s most devoted listeners, some of whom read this journal. The show has been rebranded as Saturday Night. There has been more talk and less music. The message board postings have declined. The show is doing well in the ratings and the management is satisfied with the advertising dollars. What will happen if Saturday Night Oldies is cancelled? There will be other sources where we can hear oldies or classic hits. In a three way deal the New York Times is selling classical music radio station WQXR. A Spanish organization called Univision will be taking over the 96.3 FM frequency while the classical music will move to 105.9 FM now WCAA. WQXR will now be owned by WNYC. 96.3 FM has a much better signal so classical music enthusiasts in the suburbs may have a problem with reception on 105.9 FM. Nothing in this world remains the same. It is no secret that the New York Times among many other newspapers is having financial problems and wanted to sell the station. Some years ago a former colleague interested in classical music told me that he didn't like hearing his music on the radio since with commercials they could only play short pieces. Commercial classical music stations have been accused of having tight playlists which make real enthusiasts of that genre unhappy. This is similar to a situation in 1988 when NBC got out of the radio business. It sold WYNY at 97.1 on the dial which then moved to 103.5 while WQHT moved to 97.1. I remember on that day I had two tape decks going to record the switchovers. 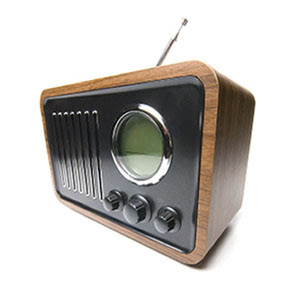 It was announced yesterday the availability of a personal stereo that can receive HD stations. I am tempted to buy it for $50. On one hand you can say for $50 this is a no brainer, but can also think that cheap is cheap. I have owned an Accurian HD radio for almost 3 years. I get reasonably good HD reception in Queens about 8 miles from the transmitter. My basic disappointment is that except for WFUV and the True Oldies Channel on 95.5 HD2, programming on HD2 stations has not been fully developed. They are still only music streams. Maybe I should wait until more portables are on the market. Anyway, I am looking around my apartment and count 10 radios including my car radio. Do I really need another one? Andrea - how many radios do you own? On his 67th birthday Roger certain disserves on of my spotlights. I have been following his career with the Byrds and as a solo artist since 1965. Roger was the anchor of the group after many personnel changes. After the group disbanded he has had a very successful solo career. Below is a solo version of Turn Turn Turn. If you search YouTobe, you will also find Roger being interviewed by David Letterman. Over the past year we have gone to several events at Flushing Town Hall right in the neighborhood. Last summer there were several free concerts on Friday night, but this year they have moved it to Sunday afternoon. Today there was a Doo Wop concert by Warren Tesoro and the Exceptions. They covered many hits from the late 50s and early 60s. Johann Santana, Pedro Feliciano, and Francisco Rodriguez combined to shut out the Cincinati Reds 4-0 at Citifield. New Met Jeff Francoeur drove in two runs for the Mets in the first inning. 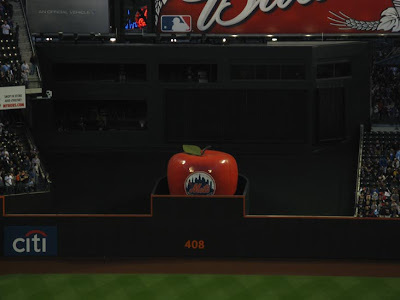 The hitting was not overpowering but enough to win as the Mets raised their record to 41-45. There is still plenty of time left and hopefully the injured players will return to make the Mets competitive in the weak National League East. Yesterday the family went to a birthday party for John Choe (lower photo) a community activist who is running for City Council in our district in Queens. 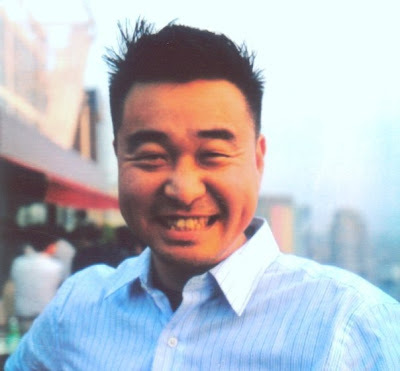 He has been active for a number of years in the Mitchell-Linden Civic Association in our neighborhood. He is running a grass roots campaign for office. He has worked very hard for his neighbors. 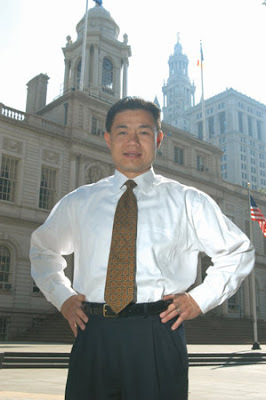 John Liu (upper photo) is the current councilman for our district and is now running for City Comptroller. He has done a good job and disserves to advance to a higher position in government. There will be a primary on September 15 for both of them to gain the Democratic party nomination for their respective offices. The general election is in November. I have avoided contacting people who were close friends years ago. I am thinking of two people from my CCNY days. I found their e-mail addresses, but never contacted them. Most of my reconnections were with casual acquaintances back then. Most of my reconnections were very brief. I exchanged a few e-mails and then the contact just died out. I can think of one person from high school (he may still read this journal) with whom I reconnected online and have maintained contact for several years. I have been friends with Roy for 42 years since we graduated from high school. He is on e-mail, but almost all of my contact with him has been through the telephone. As I ate my breakfast this morning I heard on the radio news reports that a fire overnight on the Throgs Neck Bridge necessitated its closing. Details. When I am off work on Fridays I like to go to a park walk around and read. When I left my house at about 10 AM I noticed the traffic was heavy on the Whitestone Expressway since it had to be used as alternative to Throgs Neck Bridge. I decided to use side streets to Chrocheron Park. 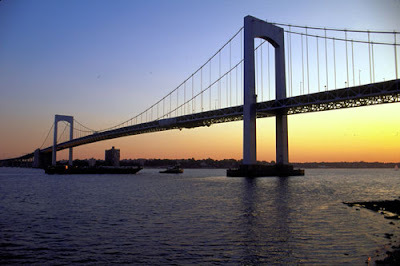 When I got there I walked along the Cross Island Parkway which was jammed until I reached Fort Totten where I could see the Throgs Neck Bridge. I actually saw a section of it that was charred from the fire. At 4 PM I heard that the bridge was open Queens bound, but closed Bronx bound. Thankfully I was not stuck in the traffic. Anyway, I really should "de-friend" many of the NJIT students whom I don't know especially if they have graduated. I should get on some Bob Dylan Facebook groups and make friends there. It is certainly very sad when a major entertainer passes away at a young age. I will certain not repeat here what has been said in the media about Michael Jackson or the circumstances of his untimely death. No entertainer has universal appeal. No person whether a celebrity or an "ordinary joe" has a pristine life story. I must object to the extraordinary media coverage given today as the Michael Jackson funeral is in progress as I am writing this entry on my lunch hour. All of the major broadcast and cable tv outlets are covering his memorial service at the Staples Center in LA. I remember in November 1963 when the entire world stopped to watch the funeral of John F. Kennedy. The death of a popular yet controversial entertainer can not be equated. I just don't feel his funeral deserves this unversal media coverage. I am especially disappointed that a local outlet New York 1 has chosen to cover the ceremony. I have always enjoyed their news coverage since they always emphasized New York City news that was meaningful. I even sent them an e-mail criticizing them for their coverage of this event. I doubt if they will respond. Does the media report or create the news? Today I was sitting on a park bench in Alley Pond Park reading the business section of yesterday's New York Times. 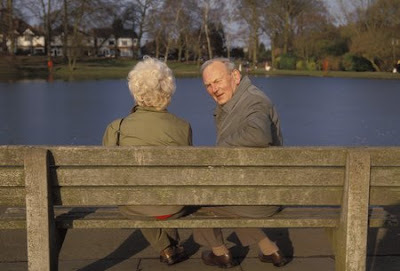 An article titled How to Make the Best of a Delayed Retirement hit close to home. Since I hit my 60th birthday this year, there have been more thoughts of retirement. Hopefully, I will only have 8 years to go when I will have completed 25 years at NJIT. I am envious of some friends who have already retired. It is nice to be able to go to a park bench and read or listen to the radio as I did today since NJIT gave us today off for the 4th of July. After a while this can get boring. The article discussed the fact that not everybody retires abruptly, they can ease into retirement by working part time for a while at their last employer. If I did that I would like to do something different. I would really want to put an end to the mundane questions that I have answered for years. There is always that great fear of not having enough money for retirement. Some of my investments in TIAA-CREF and other funds have gone down during this economic downturn. Hopefully in 8 years they will rebound. It's nice to do something different so we saw The Wiz at the New York City Center last night. Ashanti played Dorothy in this encore of a show that debuted on Broadway in January 1975. Last night's performance was the last in this run that began on June 12. Some of the other performers were Coleman Domingo, LaChanze, and Joshua Henry. We enjoyed the acting, singing, and costumes. There was a movie version of the Wiz released in 1978 starring Diana Ross as Dorothy and the late Michael Jackson as the Scarecrow. One advantage of having a journal is to find out when I last visited an attraction. On March 29, 2008 I last visited the Queens Museum of Art in nearby Flushing Meadows Park. All museums have permanent and temporary exhibits so one should never visit a museum too often or he/she will see the same attractions. I always like to see the Panorama of New York City which has been there since the 1964 New York World's Fair. There were displays of collectables from the Worlds Fairs of 1939 and 1964 which we've seen before. I guess since today was a holiday, the museum was not crowded. For a $5 admission fee, how could we go wrong? I have written about Facebook several times in this journal. You just need to go to the search box at the top and search on "facebook" to read my earlier comments. I would like to comment on an article in the AARP Magazine titled Confessions of a Facebook Addict. AARP is open to those over 50 whether they are retired or not. Believe me when my favorite bald man starts making the rounds, I wish I were retired. Anyway, Hugh Delehanty the author of this article,who is about my age talks about his experiences with Facebook. He says baby boomers are the web site's fastest growing demographic. He says that the "friending" thing was what got him hooked on Facebook. I first got invloved with it just after I attended a library seminar demonstrating how it could be an outreach tool to students. So I tried to friend as many NJIT students as I could. Since Slutsky is not a common surname I tried to befriend other Slutsky's even though there is no relation. I try to limit my time on Facebook, so I am don't consider myself an addict. There are certainly other social networking sites which I must avoid since there is only so much time in a day.